The garage door springs do most of the lifting when it comes to lifting your garage door. There are large amounts of stress put on these springs, and eventually they break down. If it's not lifting properly, chances are you need a new spring. Here are some simple tips to see if your garage door springs are broken. The door is only opening a couple of inches - then stops. A loud bang went off when opening the garage door. It's visibly broken - there's separation or gap in the spring. If any of the above happened, your spring likely needs to be replaced. The springs are vital to making your garage door lift. Without them it's impossible, the large amonut of weight and pressure over time the springs break. The spring should be located directly above the door on a bar called a shaft. If you cannot see any springs above your door, you may have what's called a Torquemaster system. A Torquemaster will only have a tube above the door with the springs inside the tube. If you suspect you may have a broken spring on your Torquemaster system, simply disconnect the door from the opener and see if works easily by hand. 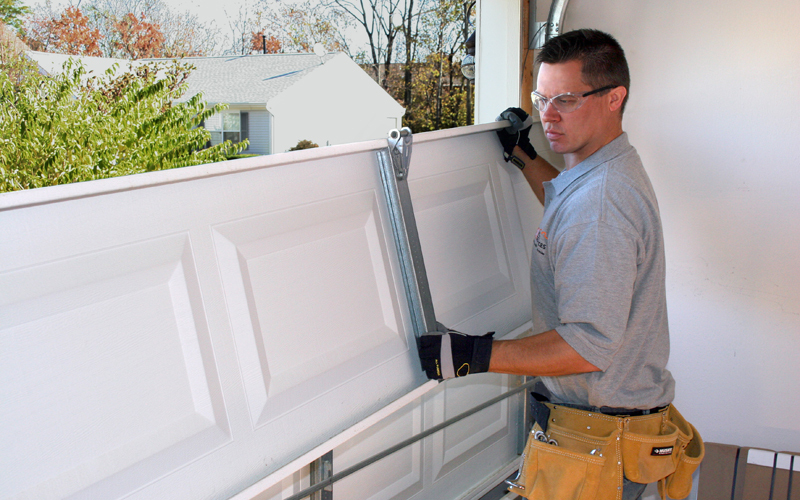 (make sure the door is down when you disconnect it from the opener) If the door seems heavy or wants to fall down once you raise it, there is a good chance the spring is broken. Need A New Torsion Spring ?